Polish writer and preacher; born at Warsaw 1814; died there 1889. He graduated from the rabbinical school of Warsaw, in which he became a teacher, filling that position up to the closing of the institution in 1862. He at the same time was preacher in the synagogue of Warsaw. At first he preached in German; but out of patriotism he in 1852 delivered the first sermon in Polish, which aroused the ire of certain fanatics. Kramsztyk officiated as preacher without any remuneration up to 1863, with an intermission of a few months in 1861-62 spent at Bobruisk. From 1863 to 1868 he lived in Saratov. 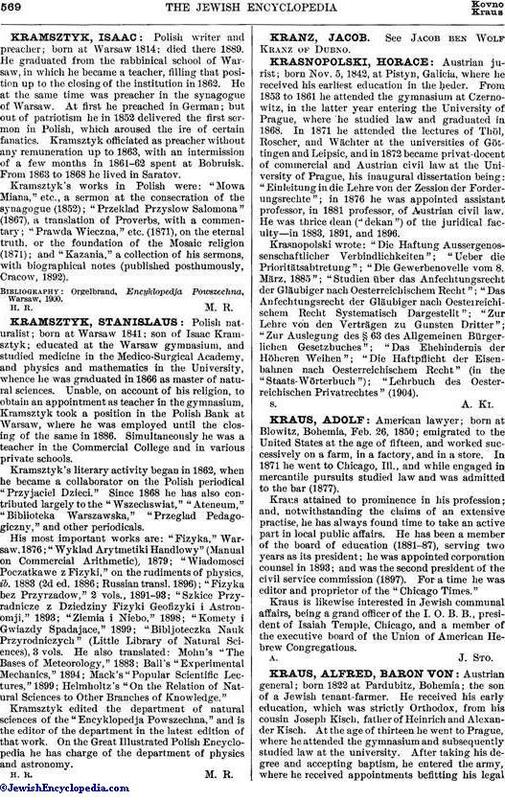 Kramsztyk's works in Polish were: "Mowa Miana," etc., a sermon at the consecration of the synagogue (1852); "Przeklad Przyslow Salomona" (1867), a translation of Proverbs, with a commentary; "Prawda Wieczna," etc. (1871), on the eternal truth, or the foundation of the Mosaic religion (1871); and "Kazania," a collection of his sermons, with biographical notes (published posthumously, Cracow, 1892). Orgelbrand, Encyklopedja Powszechna, Warsaw, 1900.